Rest can be a nice thing. Rest can also be allusive in these days of much to do about many things. The psalmist’s words seem to indicate that rest for our soul comes and goes, that soul rest is a choice, and that this kind of rest comes from the Lord. Life definitely has a way of stirring up much unrest. Seizing those times of rest for our souls takes conscience effort, possibly even directing ourselves to “be at rest.” This passage brings up one reminder of a reason for choosing rest: our Lord’s goodness. Psalms were actually sung. Picture the writer, stretching out his arms while sitting on his bed, then bursting forth into song as he allows his body to fall back upon the bed and pillow. Can you imagine it? Hey! Why imagine? Find your bed and experience it. Say or even sing your own tune to the passage above and take a few moments to rest your soul … once more. Greeting Card Design: THANK-Mieke – click here to view in the Kat Kreations online katalog. This is one of my sister’s three cats. She provided the photo for this card. Many people in my life have done many kind acts for me or on my behalf. Only One person has done such an extremely loving act as described in John’s gospel. God chose to show the depths of His love for me and every other person throughout time, even when we’ve all hurt Him tremendously since creation. He sent His Son to be the sacrifice for me. Instead of seeking my death for my own sin, God chose to accept the death of His Son in my place. Greeting Card Design: No10-ENC-HydroxChair – click here to view in the Kat Kreations online katalog. For four years, I lived in the country and was adopted by up to 14 cats over the years. This guy, Hydrox, got his name because when he was young, he looked a lot like his mom, Oreo. He was part of her third litter and the first one she had and raised on the porch. He was the BEST of the cats–loyal, loving, friendly, and such. Father, thank You for counting me as Your child! Thank You for loving me like no other ever could, ever would, ever has, ever will! Greeting Card Design: No10-GEN-JesusLovesMe – click here to view in the Kat Kreations online katalog. This mural has been painted onto a wall in church nurseries or children’s ministry areas in churches in Indianapolis and two near Washington, IN. News comes of an urgent need, a life-threatening illness, a tragedy, a life struggle, etc. that has entered our pathway. We are face to face with our own helplessness. We are paralyzed by life’s stuff. Along come people who know us, who care about us. They recognize that their role is not to fix us, change us, mend us; yet, they know just what to do: Take us to Jesus. Their knees bend as their lips address the Father–they know how to reach Him. As their praise of His sovereign power pours forth, they carry our mat toward Him, believing in His promises. Acknowledging that ONLY Jesus can help us, they speak forth their requests on our behalf, as their hands dig through toward His presence. Their hearts nearly burst and their bodies refuse to eat or drink as they attach ropes to our mat and place us into the hands of the One who holds the power that we need. When others intercede for us through prayer, their faith adds to ours (or sometimes, stands up when ours fails), and we are placed into the hands of the Ultimate Healer. Some of these intercessors we know, we see, others we only hear about or can simply sense by the Holy Spirit that our names are being spoken to the Father. What a wonder it is to know that we’ve been prayed for! Greeting Card Design: THANK-4Prayer – click here to view in the Kat Kreations online katalog. The cover design is available as an art print: click here to order. Not long before He was to face Calvary and give His life in our place on the cross, Jesus made these comments above to His followers. He paints a word picture with His words of both direction and encouragement. Branches “abide” in the vine. They are attached, one with it, nestled in, dwelling as part of the vine. In order to bear fruit, the branch just stays connected. It doesn’t wiggle and jerk around to get that fruit to pop out. As the vine supplies the nutrients to the branch, they flow through the branch to form the bud, the blossom and later the fruit. The fruit blesses other lives around it–bringing glory to the Heavenly Father, the Master Gardener in this word picture. When we make our home in Christ, nestling into His heart, choosing to abide in His will, and seeking to allow Him to flow through us, our lives become fruitful and those we encounter are blessed for having known us. Remain close to Jesus, no matter what–it’s a life that’s fruitful! Greeting Card Design: THINK-Grapes – click here to view in the Kat Kreations online katalog. The cover design is available as an art print: click here to order. No matter who you are, when the Lord looks at you, His eyes may be looking at a sinner who’s not followed His commands; but His heart chooses to have an attitude of grace toward the person He sees. When you choose to go your own way, rebelling against what He says is best for you, He still chooses to extend His grace toward you. Though your ways may be unfavorable to Him, according to His Word, He decides freely to bestow His favor on you. He gives you a gift that you could never deserve . . . now, THAT’s grace! Greeting Card Design: THINK-Grace – click here to view in the Kat Kreations online katalog. A beautiful bouquet of fragrant flowers sitting in a room can be noticed long before a person is near the vase or can even see them. The aroma greets the beholder and invites him to come savor their delight. Carried by the favorable scent, he seeks out the source of the fragrance. He desires to see for himself the blooms which have drawn and welcomed him toward such natural splendor. Long before a person in this world knows a follower of Christ personally, an aroma permeates the believer’s sphere of influence ahead of her. Her words, actions, and reputation precede her as others without Christ observe her ways. Only by the incomprehensible grace of God, her life, complete with both failures and successes, becomes a “fragrance.” He uses this inner perfume to carry to the senses of the seekers the very knowledge of the One whom they seek. We are transformed by His mercy and grace into a flower with such sweet savor that other lives are drawn to know the One who does this masterful gardening within us. 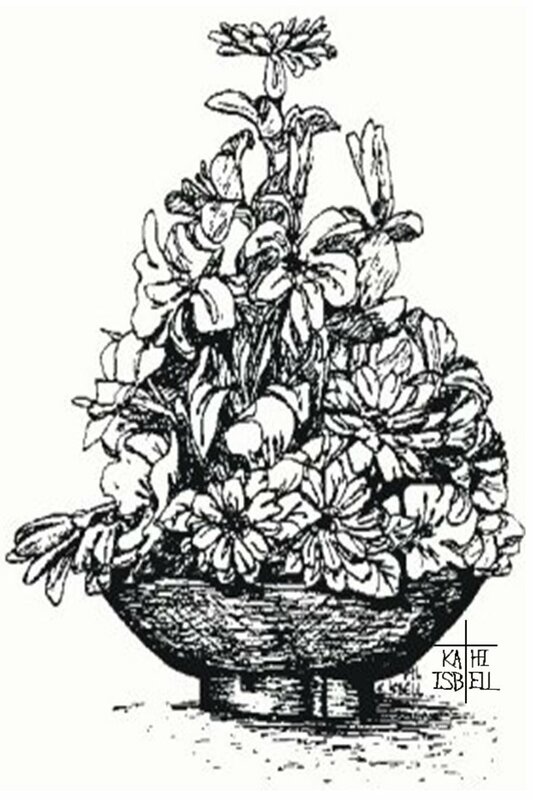 Greeting Card Design: THANK-Bowl – click here to view in the Kat Kreations online katalog.